What is the status quo of the world right now? The question can have multiple answers ranging from total population, consumption or production to broader aspects like economic development or technological advancement. Now let us rephrase and ask – how far have we really progressed as a civilization over the last few centuries? We have rapidly advanced in terms of population growth for sure (some 6.5 billion+ now), have moved on to information age but in terms of quality and equality of living of the greater mass, maybe we were better off in the past. There are around 2.7 billion people who live below U$ 2 a day. That’s 2 out of every 5. The total wealth distribution of the world has become extremely skewed. The rise of capitalism propelled by the industrial revolutions, world trade, technology, consumerism means that total resources of the world are controlled by those with economic might. The story, however, is not totally bleak or that of only profit driven institutions. The advanced economies have invested U$ 2.5 trillion over the past 60 years into the developing nations. Multilateral agencies, INGOs, donor firms and local NGOs have all done a fantastic job in transitioning many developing countries into emerging economies. However, at the same time, as countries move into the rungs of middle income status, the development initiatives will begin to look for sustainability exits coupled with downward funding pressure as a follow-up of the financial meltdown, Eurozone crisis and shifts in economic policy. Conversely, we now also identify an alternative growing opportunity. Focus has shifted on building sustainable models where we work not in isolation but hand in hand with entrepreneurs, investors and business to explore new markets, discover more customers and in the process transform lives of this 2.7 billion people. The solution lies in bringing them as an integral part of the market economy, create employment and convert them into consumers and not keep them in fringes of the informal economy. This is where the “Zero-Based Design” discussed by Paul Polak and Mal Warwick in their book “The Business Solution to Poverty: Designing Products and Services for Three Billion New Customers” can make a difference. The core idea is to look at the BoP market as a fortune (as often emphasized by the late Dr. C K Prahalad). With infusion of private capital into mission driven businesses, affordable essential goods and services need to be designed for the next ~3 billion market while generating income and employment for them. The opportunity space for businesses focusing on frugal solution is immense ranging from providing safe drinking water, electricity, low cost nutritious foods to affordable education, housing, financial inclusion to healthcare. To bring this approach to reality, development partners, private enterprise and the government now act in synergy. The sheer volume of ~ 3 billion means that if businesses can tap into this market via frugal market solutions, the economies of scale would provide the requisite sustainability. At the same time employment would be generated for the BoP, who also participate as active consumers thereby enhancing the overall economic size. Over the years, business models (for profit, development oriented or philanthropic) involving the BoP markets have seen gradual shifts. Initially, models included the BoP population as consumers or producers. However, newer business initiatives opt for co-creation and inclusion of BoP as business partners. In fact, the current philosophy of doing business with the BoP have even evolved further from ‘co-creation’ to ‘open innovation’ and facilitating participatory innovations to solve social problems. At LightCastle we use our proprietary framework to build and assess inclusive businesses. 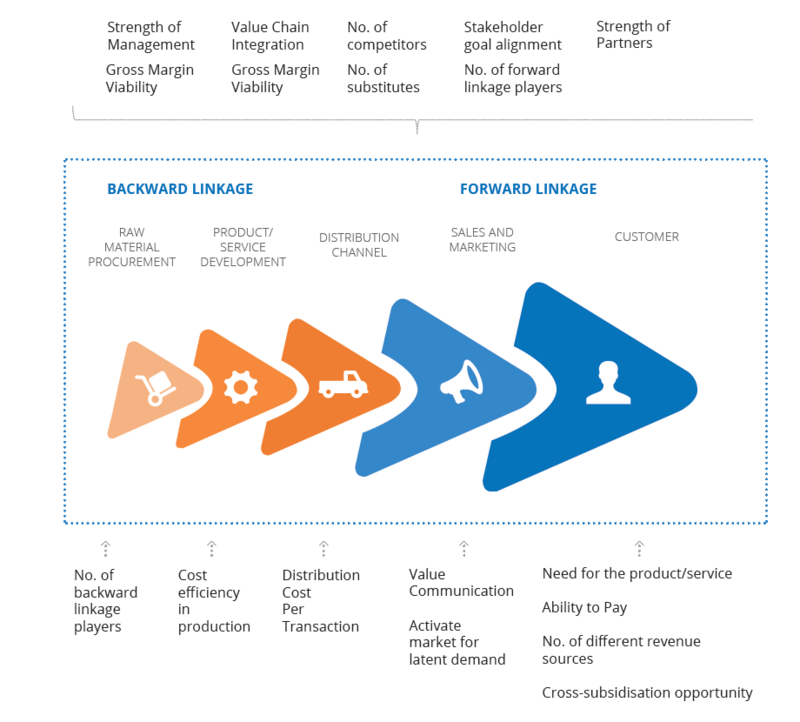 The framework is built around the “value-chain” of a business. Factors important for sustainability are linked to value creation (e.g. impact driven value proposition, alignment of goals with stakeholders), value delivery (e.g. extended distribution approaches, cross-sector partnership networks) and value capture (e.g. diversified revenue streams, gross margin viability).